And the winning streak continues. By Christopher Hughes·	 1/11/2013, 4:07 p.m. This year, Bravo has split their most popular part of any season, Restaurant Wars, into two episodes—with the winners responsible for choosing their own teammates. In episode 10, the first part of this, Kristen Kish won yet again, pocketing another ten grand in the process. How do you stay on everyone’s good side when you keep winning all the challenges? I feel like everyone would start to resent the fact that you’re slowly getting rich. KK: I guess because I’m not gloating about it. There are definitely some comments here and there, but nothing malicious. I think everyone has their mind in other places, so I don’t think it’s really on their radar. 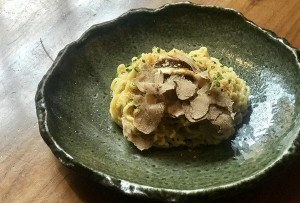 Episode 10’s Quickfire Challenge was to create an original dish utilizing ginger all within fifteen minutes. I think last night’s Quickfire Challenge was the fastest in the history of Top Chef. It was for sure. It felt like ten seconds. Fifteen minutes is such a short amount of time to conceive a dish, execute, and then plate it. Did you immediately have something in mind? My first reaction was to use the iSi canister. You can make a quick marinade or you can infuse something really fast by putting it in there and charging it a couple of times. It’ll really speed up the process. So, that was my idea and that’s really all I had. Then I just went into the pantry and just grabbed stuff. Honestly, it was a pretty thrown together dish and I wasn’t exactly happy with it. Infusing fennel in a CO2 cartridge seemed like an extremely inventive idea. Wolfgang Puck was so impressed I thought you might win on the concept alone. Have you used that technique before? I’ve never used it for that particular purpose before. Quite frankly, it’s probably the least proud of something I’ve been, only because I got caught up in the method over the flavor of the dish. Hey, at least you didn’t do a stir-fry, right? During the episode you admitted it had been a rough couple of years for you before you landed on Top Chef. A year and a half ago I was in a five-year relationship, which ended right around the same time I started at Stir. I had to move out and find my own apartment. That being said, my ex-boyfriend, whose name is Scott, was wonderful. We broke up and I lived in his house for a little bit, but it was obviously time to move out. But we’re very good friends, so no hard feelings. There were just a lot of things changing in my life at that point. In between my last job and Stir I was thinking about moving to either London or Dubai, of all places. I don’t know what I was thinking. I was just trying to run away I think. You almost moved to Dubai? God, I don’t know! I was just looking for something far away. I have to give credit to Stephanie (Cmar). She told me to come to Stir since it was just about to open. She said if I didn’t like it, then I could move. She saved me in that way. Were you already familiar Barbara Lynch? Oh, absolutely! I knew I wanted to work with her at some point, I just didn’t know when and in what capacity. It all worked out the way it was supposed to. Top Chef changed up Restaurant Wars this year. All the contestants were forced to give a preliminary idea and one signature dish. Based on that, two final restaurants were chosen. How did you come up with your restaurant name and concept? The name I gave my restaurant is Atelier Kwan. Atelier is like a craftsmanship workshop for artists and chefs and Kwan is my given last name; my Korean last name. The dish that I prepared was a take on a classic French bistro salad with egg and cheese and mustard vinaigrette. I’m not trying to reinvent the wheel or do anything completely out of the box. I like to use the nice familiar flavors of my favorite things to eat. I just like to take traditional items and tip them upside down a little bit. The egg in your dish really seemed to wow the judges. It was prepared in an “Onsen” style. Can you describe that technique? It’s essentially a sous vide egg. You can do a number of different temperatures or times, depending on what you’re looking for. I was looking for a barely set white with a really creamy yolk. From the last chef that I worked for before Barbara Lynch (Guy Martin), he taught me this method. After a lot of experimentation he settled on 149 degrees for an hour and a half. At Judges Table, Tom Colicchio and Gail Simmons were saying that it was a huge gamble to prepare eggs that way since there could be a lack of consistency. Were you worried about that at all? Yeah, but I set myself up to make sure that didn’t happen. I was moving the eggs around quite a bit and I also cooked sixty or seventy more eggs than I needed, so if one didn’t turn out the way I wanted, I just grabbed another one. One of the perks or consequences (depending on how you look at it) of winning was that you got to choose the other chefs who would work with you at Atelier Kwan. All season they’ve built up storylines around your friendships with Stefan and Micah and yet you didn’t choose them. How difficult was that and how did you approach the decision-making process? I knew that I wanted to pick Brooke (Williamson) because I really enjoy her and she’s been doing very, very well. I know people were expecting me to choose Stefan. We were actually joking the other day, and he texted me saying, “We just don’t like to mix business with pleasure.” So, I’ll stick with that. Obviously, one of the pratfalls of choosing your team was that you didn’t know who was going to get sent home. It wasn’t your intention to choose an all female team, was it? No, not at all. Once I got Brooke, I took Lizzy because, quite frankly, I didn’t think she’d get sent home. Then it came down to Micah or Josie. I hadn’t tasted Josie’s dish, nor did I hear any feedback, but I did taste Micah’s. It was good, but I wasn’t a huge fan of the concept (raw food). It was a hard decision, for sure. After your initial excitement of being announced as the co-winner with Sheldon, were you nervous at the thought of then having to lead a team and execute your restaurant vision? Absolutely! I was completely nervous. It’s a big challenge to take on. If you ask a lot of the chefs in the season, everyone wants to make it to this point. It’s one of the milestones and it’s super fun regardless of the outcome. With Boston being a focal point in the national media’s coverage of the flu outbreak, I’d like to know what you eat when you’re sick. A shot of whiskey (laughing)! 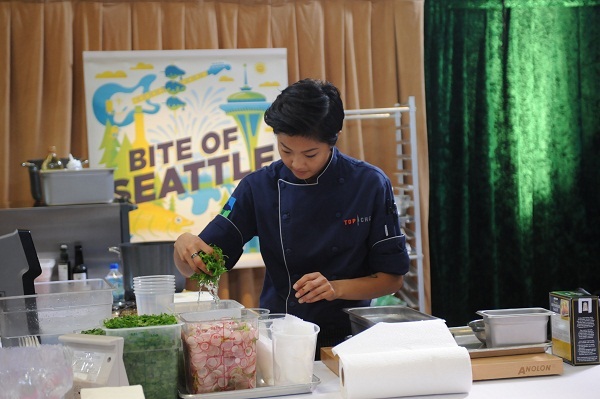 Stay tuned for more post-chow chat with Kristen Kish. For more online food coverage, find us on Twitter at @ChowderBoston.